When descending the red Pindan cliffs towards the beach and benthic flats of Roebuck Bay, one comes across several mangals and tidal creeks. The tropical mangrove forests near Broome consist of several species, such as the common grey mangrove (Avicennia marina), stilt-rooted mangrove (Rhizophora stylosa) and the red mangrove (Ceriops tagal) or lanyi-lanyi. Those forests are complex and rich habitats that require much specialization to live in, and many animals found in the mangroves are therefore absent or rare in other places. 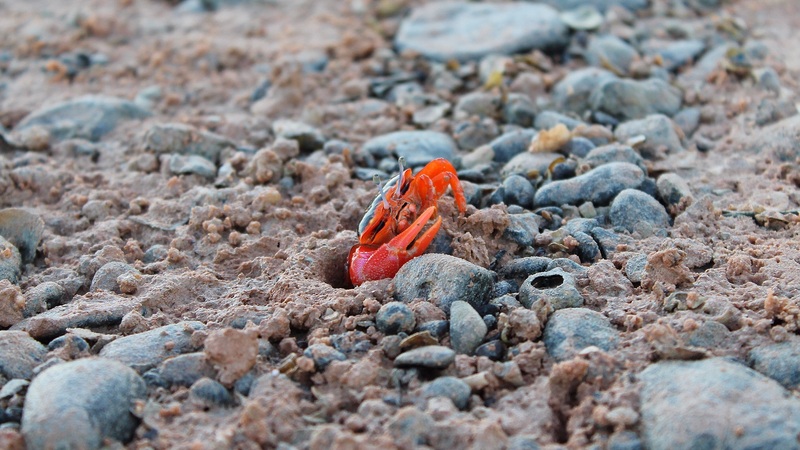 With their bright red colour, flame fiddler crabs (Uca flammula) are the most beautiful crabs of the mangroves by far. The typical big and oversized claw of this mostly vegetarian crustacean is waved to defend their territory rather than to crush food, while their remarkable appearance is further enhanced by eyes positioned on tall stalks, enabling them to detect threats from afar so they can disappear in their burrow quickly. 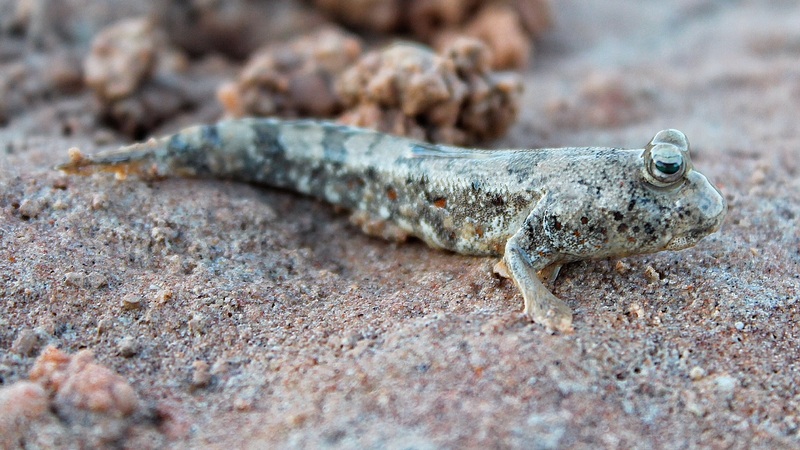 The Mangrove mudskipper is another conspicuous creature that can be found in Roebuck’s mangroves. Because they are able to breath through their skin and lining of their mouth and throat, mudskippers can live outside the water during low-tide, using their pelvic fins to walk on the mud. And although they don’t look very active, these amphibious fish are pretty agile when feeding or defending their territory. When danger is detected with their big bulging eyes, mangrove mudskippers retreat in their deep burrows, just as the fiddler crabs, only to emerge when they assume it is safe. Especially when the tide moves back in, a variety of larger fish-eating birds like Great Egrets (Ardea Alba) can be spotted to feast on the reappearing mudskippers. Other birds that can be found in the mangroves might be smaller, but display rather spectacular colours such as the Sacred Kingfisher (Todiramphus sanctus). 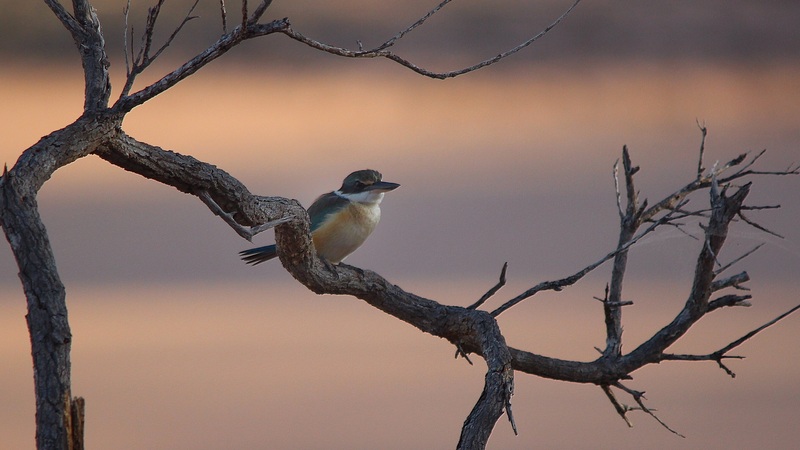 Although mainly associated with forests and woodland habitats, this kingfisher is common in the mangroves of Roebuck Bay, perching on branches on the lookout for mosquitoes, crustaceans and little fish. The Rainbow bee-eater (Merops ornatus) is not strictly confined to the mangroves too, but the abundant insect life near the water edge proves very attractive, while the Pindan cliffs provide good nesting tunnels. With its bright coloured feathers and typical tail streamers, this stunning bird migrates to New Guinea every winter. 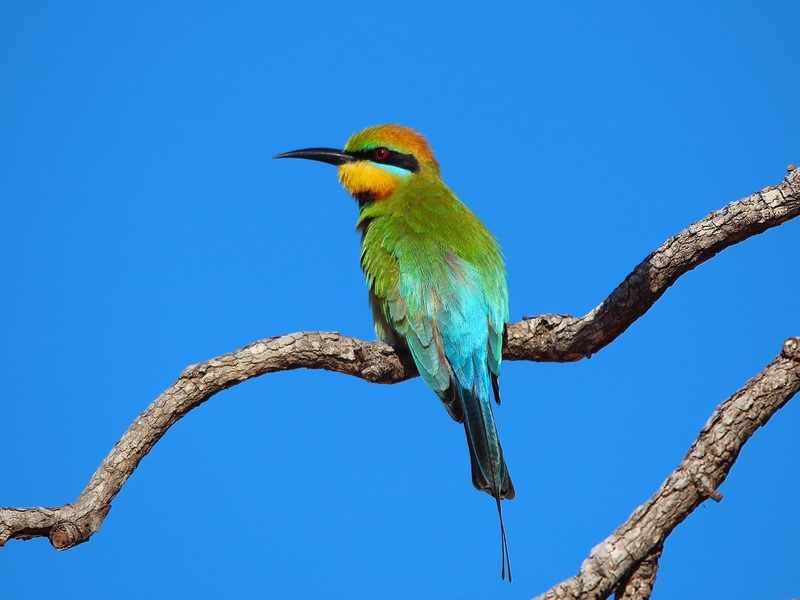 However, as the southern population replaces the northern, bee-eaters can be found in Broome all year round. I have checked their nesting tunnels near Lake Herdsman recently, and will be on the look-out for their return in several months time, but in the meantime there are still many other stories to tell – stay tuned! Great pictures again. I love that bee-eater! Thanks so much ladies! The bee-eater is a winner indeed; it decided to sit still on the branch for 10 seconds, just long enough to move in and get a sharp shot. This is the best! I wish I could be there right now. I was so excited when we saw a bee-eater in the Daintree area of Australia. Hopefully we will again next time. The mudskipper is so cool! I saw a nature show I think a couple of decades ago that featured them (with David Attenborough). I’ve never forgotten them – they made quite an impression. The flame fiddler crab is gorgeous. And the great egrets – ours in Florida never really feed together in a group. They tend to feed alone. Probably a function of food availability. Thanks for a great post! Thank you so much Pam, and I’m really glad you like the photo’s; it’s a very special place indeed. I was surprised by the number of Egrets too, but you are right about food availability as not only mudskippers but big schools of jumpy Popeye mullets visit the Bay frequently. Super images and a diversity. Interesting read. The mangroves look to have great photographic potential.Thanks for this interesting post. Fascinating information and wonderful images. So intriguing how the creatures all fit in a functioning ecosystem. Great post! Thanks Liz, I’m happy you enjoyed the read! It’s a very complex and intriguing ecosystem indeed, much more diverse than the landscape suggests at a first glance. What a good timing for the picture of the crab ! very interesting post as usual. I can imagine ! But the result is gorgeous, it was worth the pain !